The Project Manager allows to create the list of graphic files and photos from different folders for their viewing as a slide show. Click the "Add" button to add the file to project. For this purpose it is possible to use drag-and-drop and double click. Click the "Add all" button to select every image in the directory with the supported extensions. "Remove" and "Remove all" take chosen files back out. Click the "Save" button to write project (list of graphic files) to the file with TXT or PSSP (Photo Slide Show Project) extension. You can use "Up", "Down" and "Sort" buttons for image manipulation on the list. 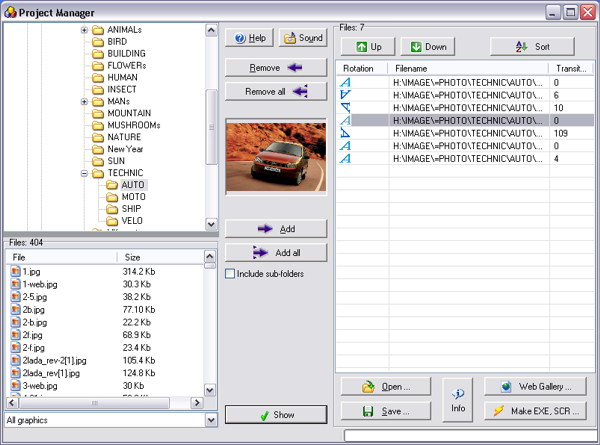 Press "Make EXE, SCR" button when finished collection of required files for viewing in the right panel. Click the "Save" button to save the slide show under the chosen file name.